The Journal of Nuclear Medicine Technology will be listed in the Emerging Sources Citation Index. RESTON, Va. – The Journal of Nuclear Medicine Technology (JNMT) has been selected by Clarivate Analytics for inclusion in its Emerging Sources Citation Index. This coverage begins with 2017. The Emerging Sources Citation Index (ESCI) covers all areas of the scholarly literature of the sciences, social sciences and arts and humanities. To be accepted for coverage in ESCI, a journal must be peer reviewed, follow ethical publishing practices, meet certain technical requirements, and be recommended or requested by a scholarly audience of Web of Science users. Journals in the ESCI are discoverable via the Web of Science with an identical indexing process to any other indexed journal, with full citation counts, author information, etc. SNMMI also publishes The Journal of Nuclear Medicine, which is listed in Clarivate’s Science Citation Index Expanded (SCIE). JNMT’s selection for the Emerging Sources Citation Index could possibly lead to future inclusion in SCIE. Please visit the SNMMI Media Center for more information about nuclear medicine and molecular imaging. 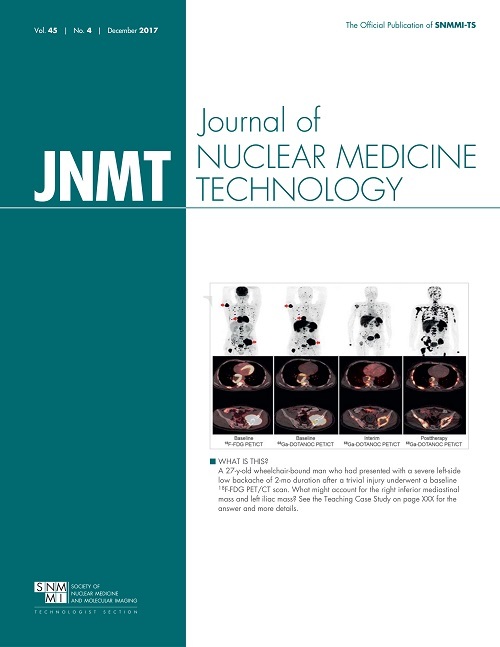 Current and past issues of the Journal of Nuclear Medicine Technology are available at http://tech.snmjournals.org. Published by the technologist section of the Society of Nuclear Medicine and Molecular Imaging (SNMMI), the Journal of Nuclear Medicine Technology (JNMT) focuses entirely on the technology crucial to nuclear medicine. In peer-reviewed articles, every quarter the journal offers recent technically centered articles on imaging and instrumentation, radiopharmacy, quality assurance, radiation safety, and more. JNMT also serves as an invaluable continuing education tool, with teaching editorials, reviews of programs and certification updates, and continuing education articles.